I'm so excited, I can't wait! 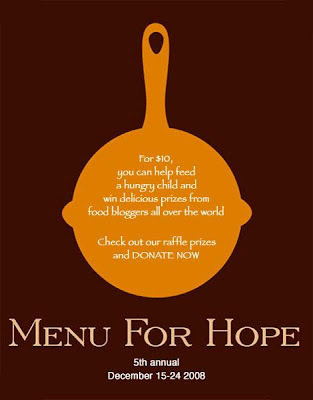 Click here to find out about Menu for Hope V and I'll be back later today to tell you what I donated and how you can bid! Oh, OK! If you just can't wait to see, head over to Jaden's Steamy Kitchen to see the list of items being offered by East Coast food bloggers, including one from Cora Cooks - item UE21. Your kitchen needs it! Menu For Hope V Deadline Extended! MERRY CHRISTMAS FROM CORA COOKS!